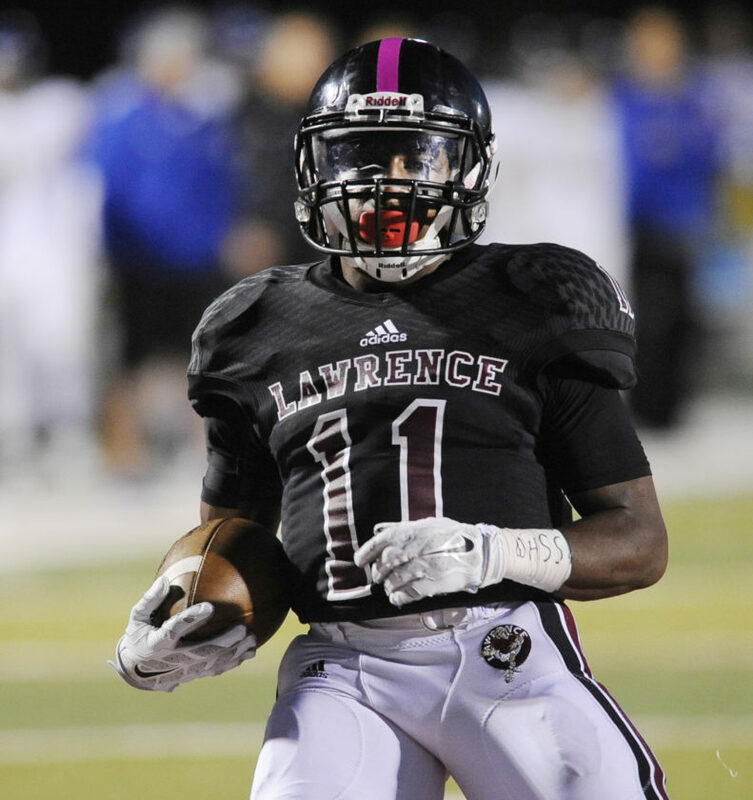 LHS senior Price Morgan leads the Lions onto the field on Friday night as they hosted Olathe South. 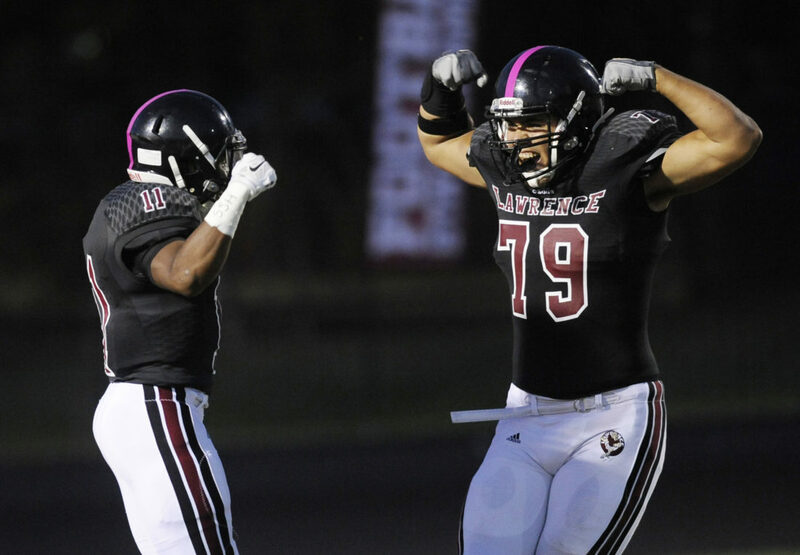 Lawrence High's JD Woods celebrates with teammate Trey Georgie (79) after Woods scored a touchdown in a 63-7 victory over Olathe South on Friday, Oct. 9, 2015, at LHS. 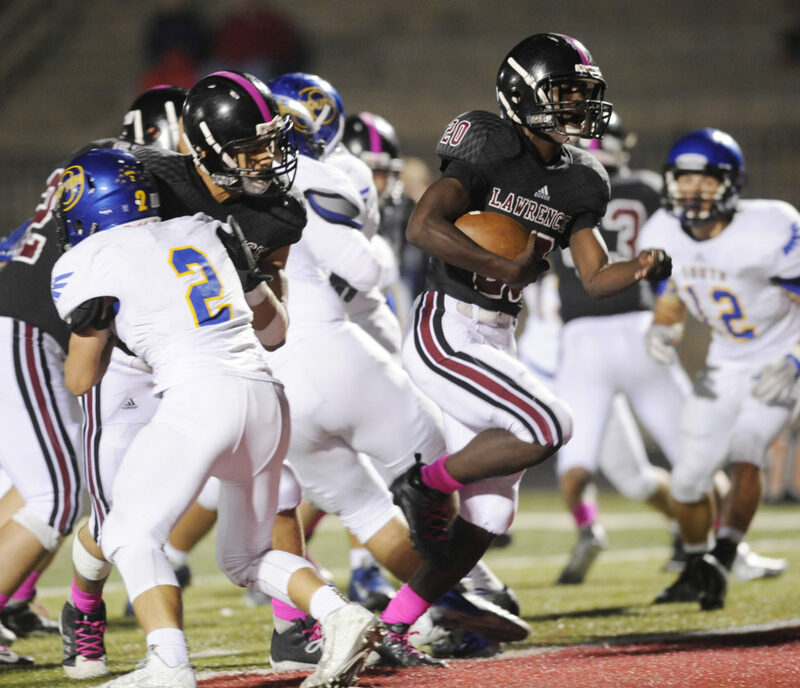 LHS senior JD Woods heads to the end zone in a 63-7 victory over Olathe South on Friday, Oct. 9, 2015, at LHS. 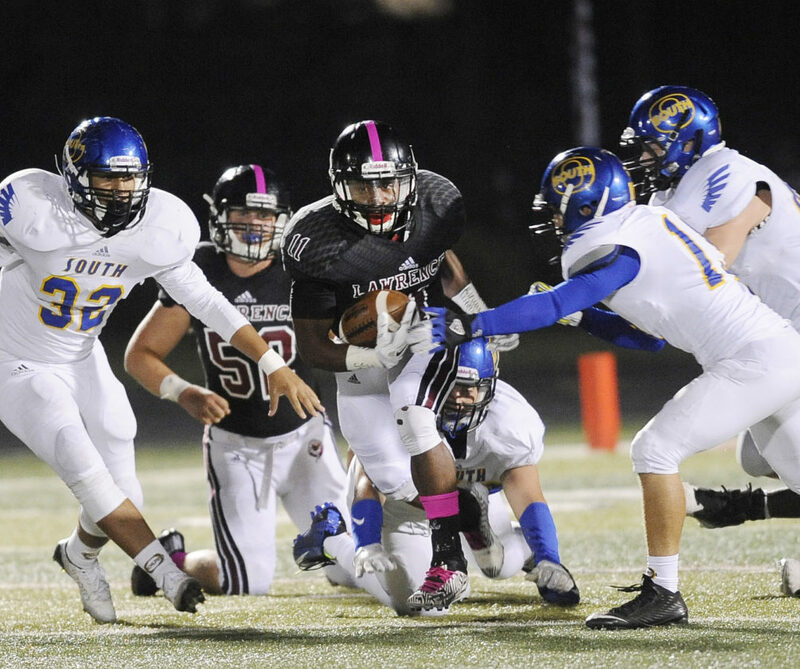 LHS senior JD Woods, right, tries to evade Olathe South's Nick Jouret in a 63-7 victory over Olathe South on Friday, Oct. 9, 2015, at LHS. 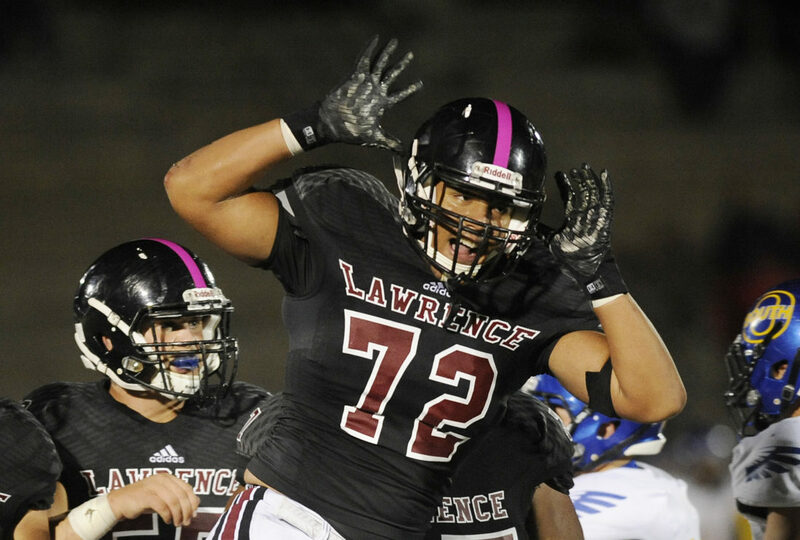 LHS senior Amani Bledsoe gives his signature salute (the Moose) after a sack in a 63-7 victory over Olathe South on Friday, Oct. 9, 2015, at LHS. 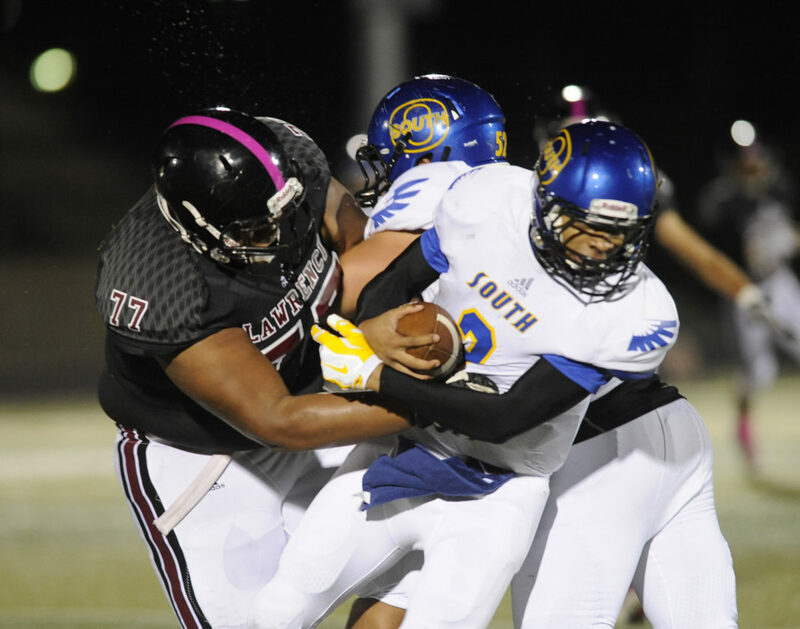 LHS senior Nate Koehn (77) puts a stop to Olathe South's Andras Glenn in a 63-7 victory over Olathe South on Friday, Oct. 9, 2015, at LHS. 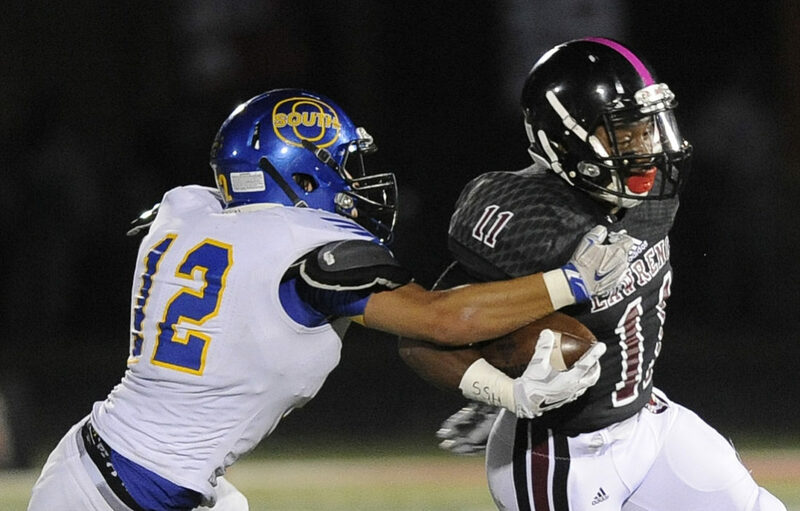 LHS senior JD Woods (11) looks for running room in a 63-7 victory over Olathe South on Friday, Oct. 9, 2015, at LHS. 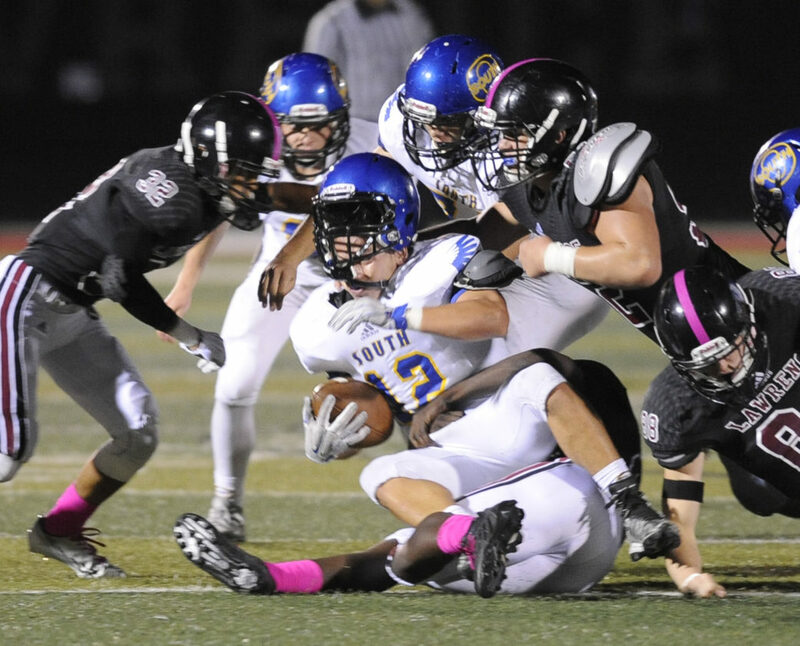 LHS senior Alan Clothier puts a move on an Olathe South defender in a 63-7 victory over Olathe South on Friday, Oct. 9, 2015, at LHS. 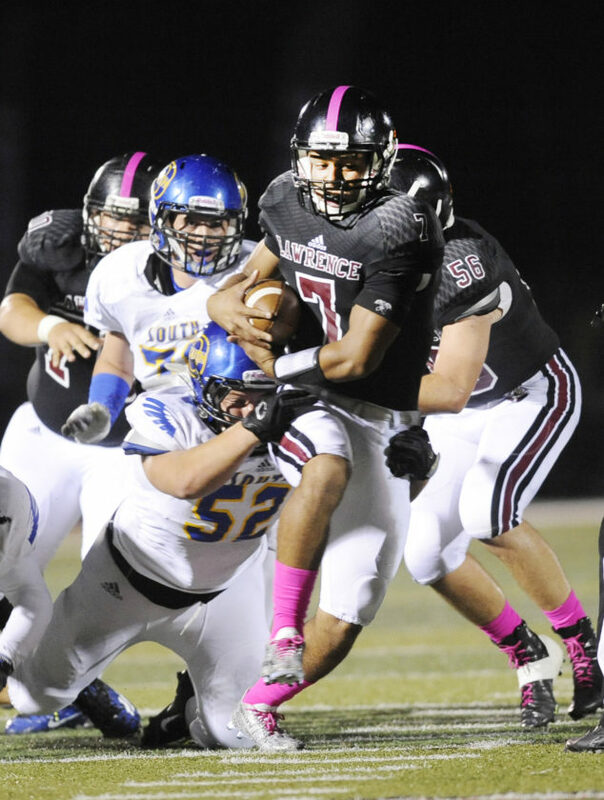 LHS senior quarterback Alan Clothier (7) heads up the middle for a big gain in a 63-7 victory over Olathe South on Friday, Oct. 9, 2015, at LHS. 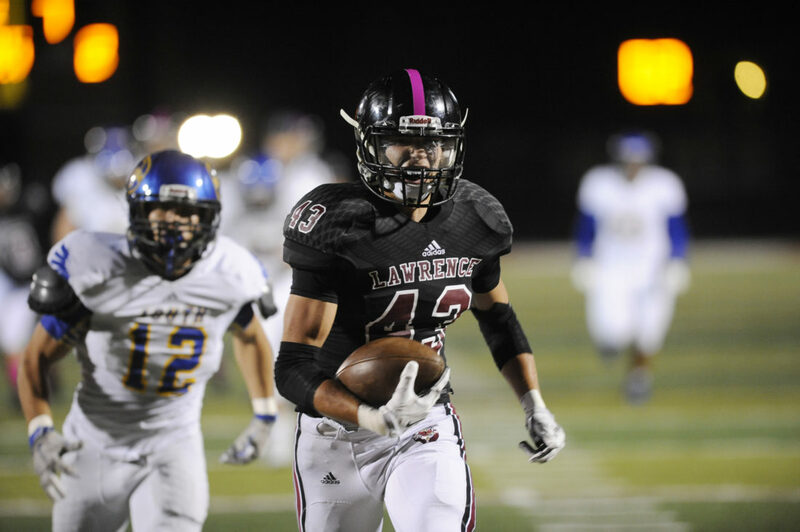 LHS senior Konner Kelley (43) takes off on a 35-yard touchdown in a 63-7 victory over Olathe South on Friday, Oct. 9, 2015, at LHS. 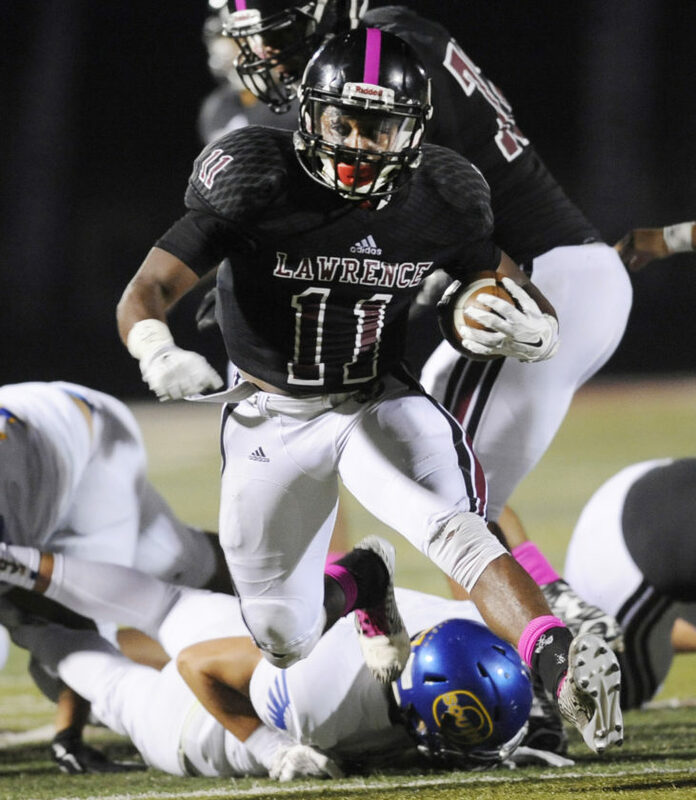 Lawrence High's JD Woods goes 25 yards for his fifth TD of the night in a 63-7 victory over Olathe South on Friday, Oct. 9, 2015, at LHS. 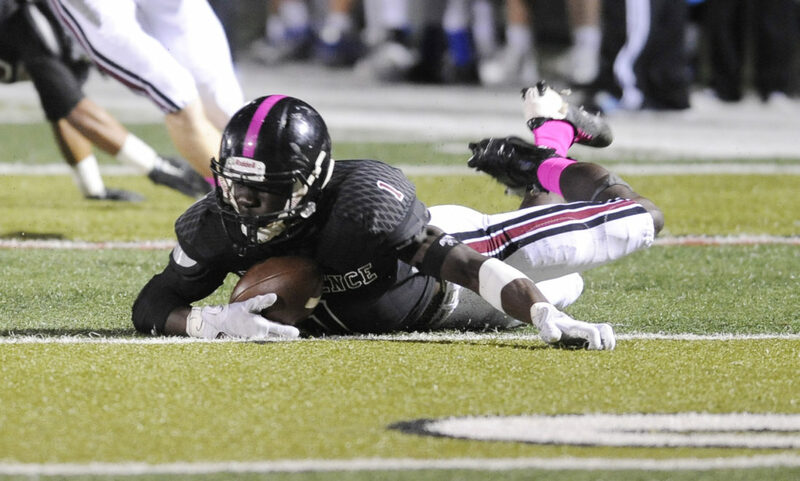 The Lions' Peter Afful comes up with a loose ball in a 63-7 victory over Olathe South on Friday, Oct. 9, 2015, at LHS. 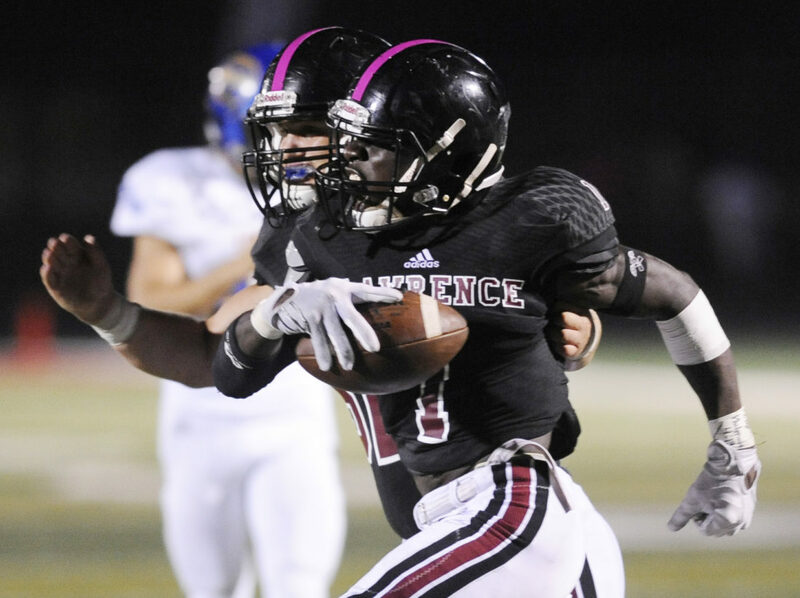 Lawrence's Peter Afful (1) celebrates his fumble recovery in a 63-7 victory over Olathe South on Friday, Oct. 9, 2015, at LHS. 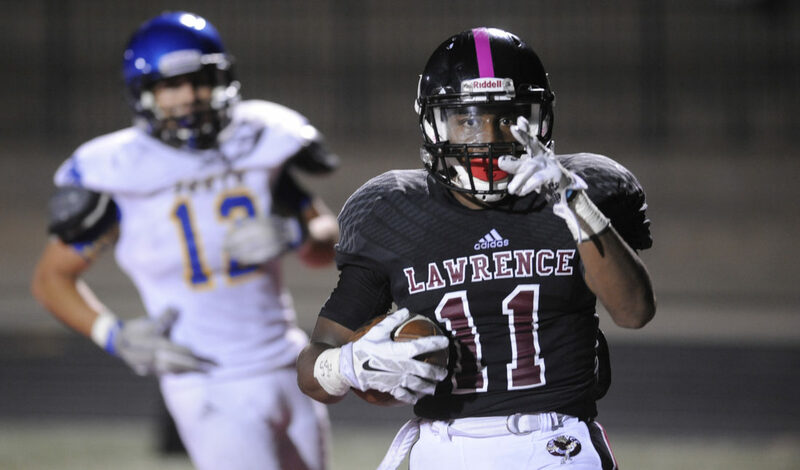 Lawrence High's defense takes the helmet off Olathe South's Nick Jouret (12) in the Lions' 63-7 victory over Olathe South on Friday, Oct. 9, 2015, at LHS. 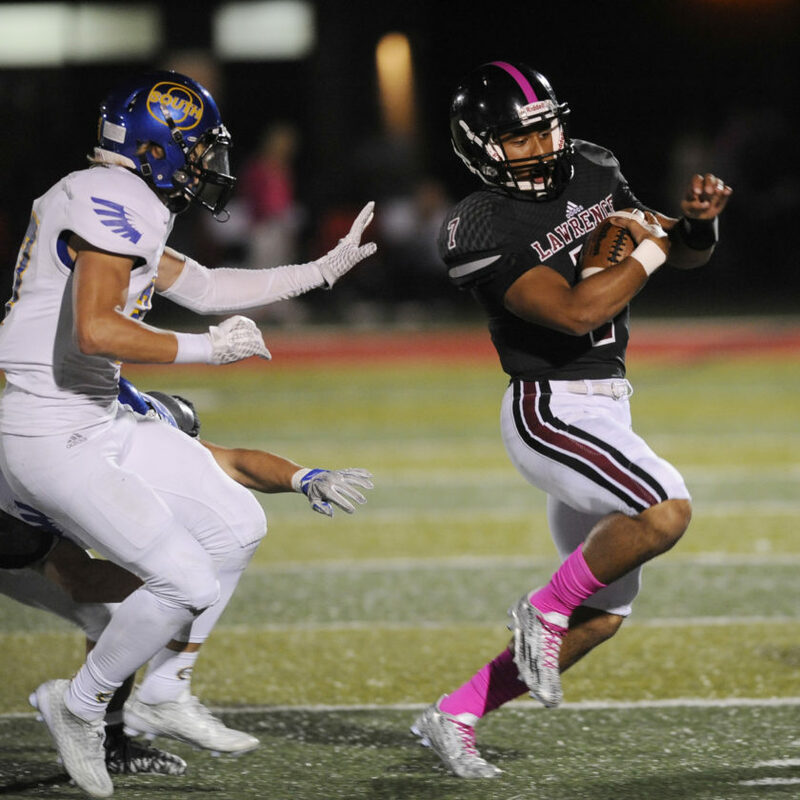 Lawrence High junior James Reeder (20) scores a touchdown in a 63-7 victory over Olathe South on Friday, Oct. 9, 2015, at LHS.